Onyx has two built-in ways to control access to your sites. This article describes using IP address protection to restrict access to the WordPress admin login/dashboard. This does not prevent users from accessing your site, it only restricts access to the WordPress admin login/dashboard. You could use a 'Maintenance Mode' plugin to prevent users seeing your site whilst it's in developement or whilst you are making changes. There are two steps to complete, firstly enabling the admin IP protection, and then secondly providing the allowed IP address(es). 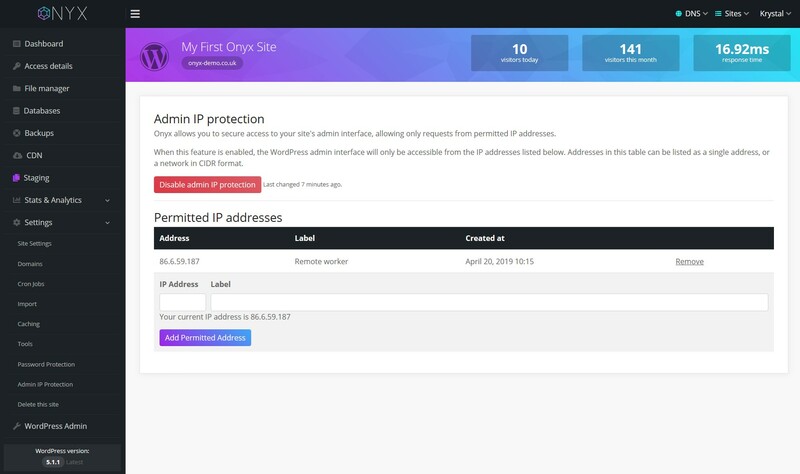 Once admin IP protection is enabled, all IP addresses, except those explicitly permitted, will be denied access to the Wordpress admin login/dashboard. Changes made here (enable/disable or add/remove IP) can take up to 60 seconds to be live. We have a separate article on using Password protection which restricts access to the whole site and could be used in place of, or as well as a maintenance mode plugin. Drop down the Settings menu and select Admin IP Protection. Click the 'Enable admin IP protection' button. Once enabled this button will change to 'Disable admin IP protection'. This can be clicked to remove the admin IP protection. Enter a permitted IP address and give it a description label. The system displays your current public IP address should you wish to add that. If you are adding a remote IP address be sure to add the external/public IP address. This can obtained on the remote computer by typing 'what's my ip' in to Google - you'll be shown the current external IP address. Also, note that not all public IP addresses are static. If a remote users IP address changes (for example if they reboot their broadband router) their access may be blocked until you re-add their permitted IP address. Click the 'Remove' link next to the IP address you wish to remove. You will be prompted to confirm removal, click OK and the IP address will be removed.